It took me a month and 5 days to go through innumerable articles, blogs, research papers and cinematic reference materials, to be able to jot something crisp about Satyajit Ray from his vast ocean of Filmography. And then finally I came across my weapon of choice to share with you some interesting information on Manik da (Satyajit Ray’s nickname). I picked the most fascinating yet uncanny unspoken message behind most of Ray’s work. If you meticulously watch all the above movies, you will feel Ray’s ardent love for his young audience. The movies catered immense learning amidst entertainment for children; and each one had a strong moral to learn from its narration and story. And if you are still thinking where did Ray get the expertise to understand his young audience so well, don’t forget he belongs to the great Ray family known for four generations from Upendrakishore Ray Chowdhury to Sandip Ray – all great storytellers. As a child I had strong memories of many of the books by Upendrakishore Ray Chowdhury because I had read them over and over again. 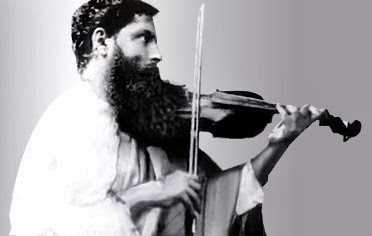 Upendrakishore was an accomplished writer, painter, violin player and composer, technologist and entrepreneur. He was the grandfather who wrote storybooks for children. “Tuntunir Boi” with its illustrations, coupled with the version of Ramayan and Mahabharat that he had written for children were some of the earliest books I read. Speaking of his illustrious ancestors, Satyajit Ray himself never hesitated to rate Upendrakishore Ray’s draftsmanship as an illustrator higher than that of Sukumar Ray. 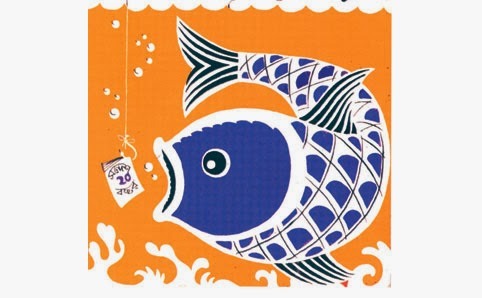 The children’s monthly magazine “Sandesh” that Upendrakishore started in 1913 always had the best of stories and drawings. After the death of Upendrakishore Roy Chowdhury in 1915, his eldest son Sukumar Ray succeeded as the editor of the magazine in 1915. 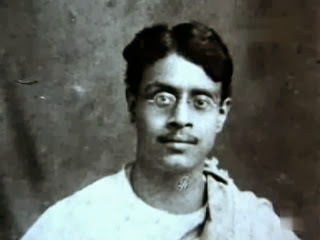 The Sukumar Ray years established "Sandesh" as a unique magazine that combined literary values with humour and fun and a lot of information from different parts of the world. Sukumar (father of Satyajit Ray) was a Bengali humorous poet, storywriter and playwright. As perhaps the most famous Indian practitioner of literary humour, he is often compared to Lewis Carroll, who dedicated his life in writing poems and short stories for children (primarily). His works such as the collection of poems including "Aboltabol" "HaJaBaRaLa", short story collection "Pagla Dashu" and play "Chalachittachanchari" are considered great masterpieces equal in stature to Alice in Wonderland, and are regarded as some of the greatest treasures of Bangla literature. More than 80 years after his death, Ray remains one of the most popular of children's writers in both West Bengal and Bangladesh. Deep within the roots of Ray family, each generation carried their love for children through their work and along carried the glimpse of it through the children’s magazine “Sandesh” which was periodically published. I got introduced to Ray’s iconic sleuth Feluda through the pages of Sandesh magazine and Feluda is a part of my household today through Satyajit-Sandip Ray’s cinematography and through the pages of Anadamela Pujabarshiki. All Bengalis have “daak-naam” meaning, nick names. 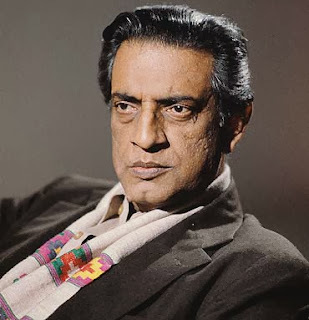 And as his admirers and friends called Satyajit Ray Manik da, so was the detective character Pradosh Chandra Mitter given a daak-naam as “Feluda”. Feluda was tall, ambidextrous, a quiet brooding man who had a sharp eye for every detail. Each Feluda story (targeted mainly for Ray’s young audience) was set in a different city, full of historical trivia and wonderful sketches done by Ray. Feluda was the sleuth who solved all the unsolvable mysteries along with his cousin Topshe and friend Jatayu. Jatayu joined Feluda in the sixth adventure and remained there till Indrajal Rahasya. That was the last adventure of Feluda penned by Ray. Ray was meticulous in his documentation and he wrote copiously for children. From 1972, Ray started putting the date when he started a new story and also marked the date when he would complete the story. A short story would be completed in anything from two to five days. A novella would take as little as three days and a full-length novel would need six days of writing or at most about thirty-three days. The Feluda stories first showed up on celluloid with “Sonar Kella” made in 1974. Ray wrote the sixth adventure of Feluda in 1971. The film was set against the backdrop of the fort in the city of Jaisalmer that was built in the twelfth century. Feluda chases the two villains who have abducted a young child who recalls living in a golden fort in his previous birth. The yellow sandstone walls of the Jaisalmer fort glow in the light of the setting sun camouflaged in the yellow desert. What an unforgettable cinematic moment with a strong central character of a child – “Ray’s another dedication to his young audience”. The second cinematic adventure of Feluda was Joy Baba Felunath. It was set in the city of Varanasi. Complete with the shots of the bathing ghats, sadhus and the serpentine lanes, Benaras seemed like the most logical setting for the villain Maganlal Meghraj's den. Utpal Dutt’s performance as Maganlal Meghraj is understated and unforgettable. The moment you see him on screen you need to hide behind Feluda who is the only one who is staring back at the villain as he engages in a battle of the mind. What a lovely treat as a film! Ray’s legendary work “The Apu Trilogy” (another treat to his young audience) appears in the Time magazine’s all time 100 greatest films made since 1923. He was awarded the Dadasaheb Phalke award in 1985 and received the Bharat Ratna and an honorary Oscar shortly before he passed away on 23rd April 1992. I have been deeply influenced by his approach to telling stories and his sketches that accompanied each one of the adventures of Feluda. It’s been long Feluda has stopped telling us about his adventures and so summer vacations have never been the same for Bengali young readers. Sandip Ray also guided the children's magazine Sandesh, which was founded by his great-grandfather Upendrakishore Ray, and continued by his grandfather Sukumar Ray and his father Satyajit Ray. From 1992, after the death of Satyajit, Sandip was the Joint Editor of the Sandesh (magazine). 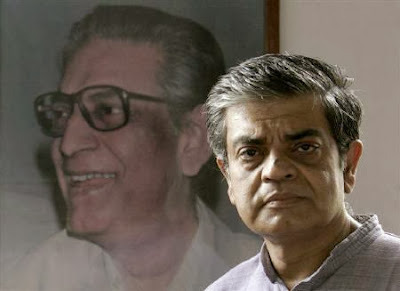 Sandip Ray, after his success in making Feluda movies, has recently come up with his account of time he had with Feluda, the famous Bengali detective created by his father, in a book named Aami aar Feluda. Sandip's book deals with the background stories of all Feluda Movies and Telefilms. Aami aar Feluda is ghostwritten by author Sebabrata Banerjee. Sebabrata has tried to follow the smart and fluent style of writing introduced by Satyajit Ray that has made the new Feluda number a good reading experience. Currently he is busy in making film on 'Tarini Khuro’, which is also an interesting character among children created by Satyajit ray besides Feluda and Prof. Shanku. Ray created characters for children that will remain etched in everyone’s memory. 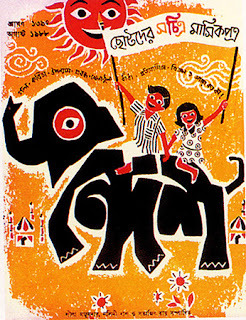 And did I mention what a prolific illustrator Satyajit Ray was! Ray mastered his own unique style that we have come to love. As a youngster Ray learnt painting and graphic art for two years and five months at the Tagore University in Shantiniketan. He learnt to wield his brush with amazing dexterity. He illustrated his book covers, film posters, children’s books, billboards, publicity material and even the title cards. Yayy !! It's time for double celebration as I complete one year of blogging which started last Diwali. And it has been an incredible journey amidst all you loving readers n bloggers. Let us all together invite the festive season home... And pray Maa Kali (in Bengal) and Lakshmi (elsewhere) for a healthy, wealthy, prosperous, happy, celebrated life ahead. 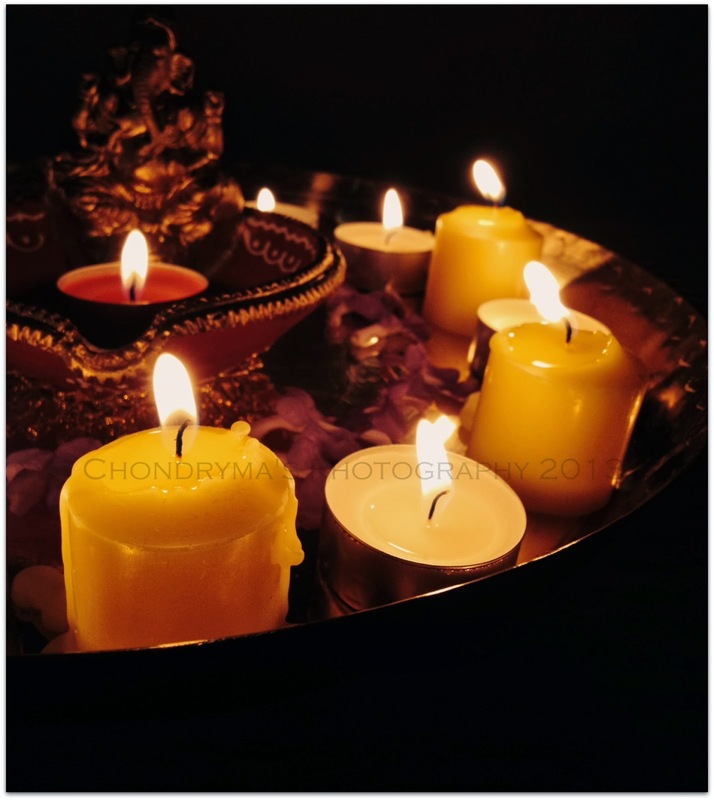 "Diwali ki dher saari shubhkaamnayein - Wish you all a very happy Diwali"
Its 2 days away from “Mahalaya” and a week apart from Durgotsav / Durga Puja… and I can actually smell bhorer sheuli r mishti gondho (fragrant sweet smell of the morning bloom) with the gentle breeze blowing in my backyard. And then I wake up to realise it is not Sheuli (the fragrant white flower of Bengal) but the fragrant native bloom I planted last week. Perhaps, it is the exuberance my soul carries around this festive season and I find myself so close to my Bengal, my people, my family and my fond memories of childhood. Yes, indeed, the homecoming is celebrated in the awakening of the conch shell and the deity is invited with the rhythm of dhaak (http://en.wikipedia.org/wiki/Dhak_%28instrument%29). And as the days get closer, the nature hymns “Aagomoni” in the backdrop of the golden sun. 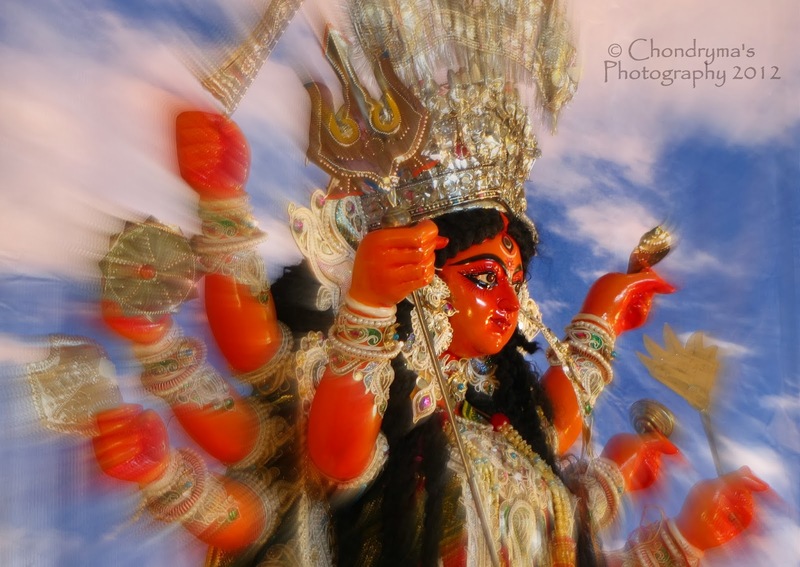 Come “Mahalaya” and Bengalis get busy to complete the final preparations for their greatest festival - Durga Puja. It's a kind of invocation or invitation to the mother goddess to descend on earth - "Jago Tumi Jago". This is done through the chanting of mantras and singing devotional songs. Since the early 1930s, Mahalaya has come to associate itself with a radio program called “Mahisasura Mardini” or “The Annihilation of the Demon” – which is played at pre-dawn, around 4 am in the morning. 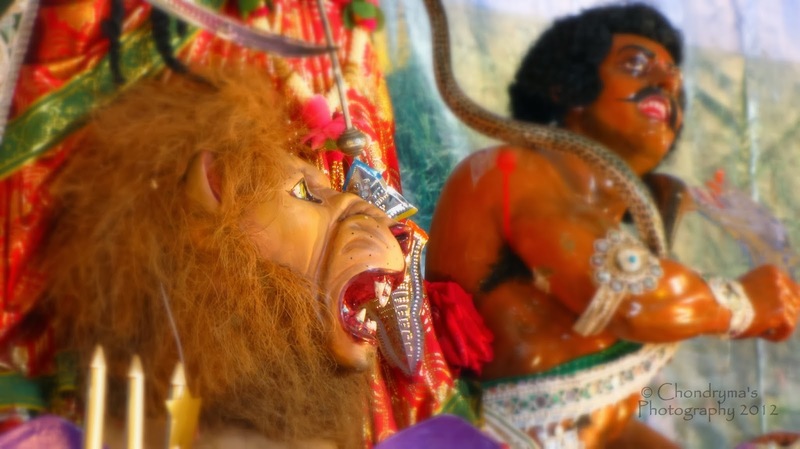 For nearly six decades now, every house in Bengal wakes up in the pre-dawn hours, 4 am to be precise, on the Mahalaya day to tune in to “Mahisasura Mardini” broadcast. This All India Radio (AIR) program is a beautiful audio montage of recitation from the scriptural verses of “Chandi Kavya”, Bengali devotional songs, classical music and a dash of acoustic melodrama. As the recital begins, the serene morning air resonates with the long drawn sound of the sacred conch shell, immediately followed by a chorus of invocation, melodiously setting the stage for the recitation of the Chandi Mantra (sacred chants). 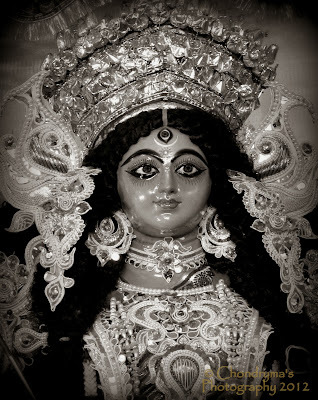 Well, my family gets to bed early the previous day to wake up to listen to the Chandi Mantra from youtube on Mahalaya - even here in Australia – and gets immersed into the spirit of homecoming of Devi. And as we listen, we remember the man, Birendra Krishna Bhadra, whose legendary voice narrates the story of the descent of Durga to earth through Mahalaya Chandi Paath (sacred chants of Devi Chandi). "Ya devi sarbabhuteshshu, sakti rupena sanksthita Namasteshwai Namasteshwai Namasteshwai namo namaha"
The best feature to highlight a Bengali home can be inherited from a Bangla wedding and when it comes to this discretion, what could be better than serving a platter of a Bengali Bride's asset to enhance the decor on your table-top. And when it comes to picking the best of the bridal asset, shidoor kouto (vermillion container) , gaach kouto, kori and sankha is definitely my pick from the lot. Each of these items have their own significance in a Bengali wedding (significant to the bride and to the family she is entering to). The "Gaach Kouto" is a pot containing a red powder, called sindoor, and a silver coin, which is believed as an accessory of Goddess Lakshmi. 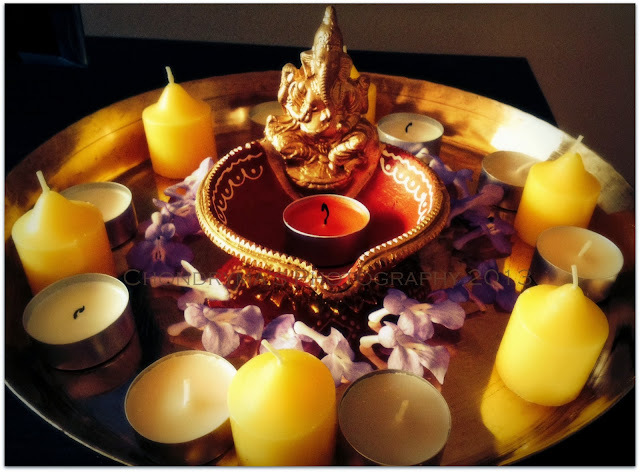 So Gaach Kouto symbolizes to bring wealth and blessings of Maa Lakshmi. Talking about another significance, "Sankha Porano" (wearing Sankha bangles) ceremony is performed by the bride at her wedding. She dons a new sari and the sankha pola, or the conch-shell bangle that has been washed in turmeric water. While the priest chants the sacred verses, 7 married women help the bride wear this bangle that is symbolic of a strong and long lasting relationship. 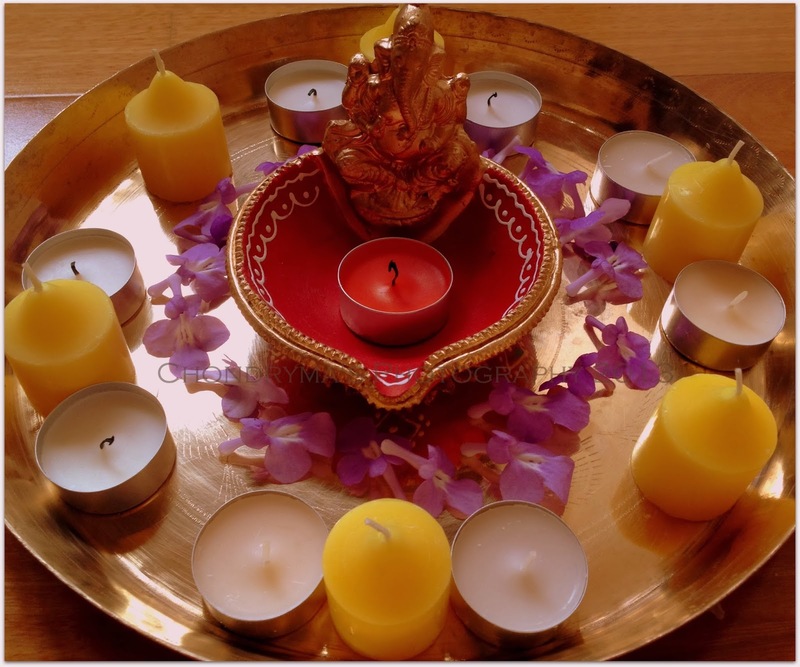 So why not carry the blessings of Maa Lakshmi and the bond of a long lasting relationship embedded in the decor of your house to make it symbolic, colorful yet meaningful hub. ...... my weekend project - simple yet elegant Indian Pearl earring - made at home with ease. This is a lovely DIY project which you can wear for yourself or gift it to your family & friends. This is a very basic design for beginners and I hope to share with you few other ideas as I create them. Take small amount of beads (I used 3 with 3 different sizes) and put them on the headpin. Keep 1 centimeter on the top of the headpin and then cut with the sharp part of your pliers. Take flat nose pliers and in the part at the end of where you cut it, curl it around one time. Take the earring wire and open the circle with your pliers. Hook the earring circle onto it and close up the circle on the earring wire. Isn't that simple? - Now try yours and do not forget to share your elegant pearl drop DIY with me. A beautiful house is every women’s dream – a house where the family comes together to share special bonds, a house where memories are created & re-created, a house to share love with someone special, a house to re-live your dreams, a house you can truly call “amaader baari” (our home)…. As my husband and I embarked on this new journey to get closer to our dreams, we built our abode of love this year holding each other’s hand. 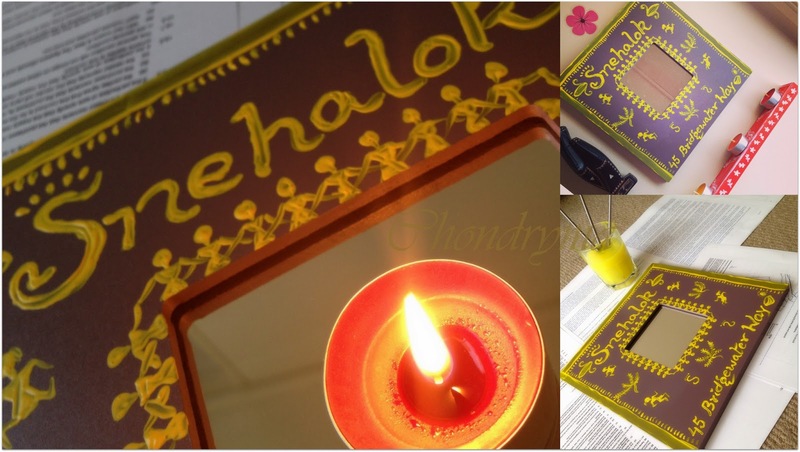 Away from the hustle and bustle of city life, rests our dream abode “Snehalok” (meaning light of love). 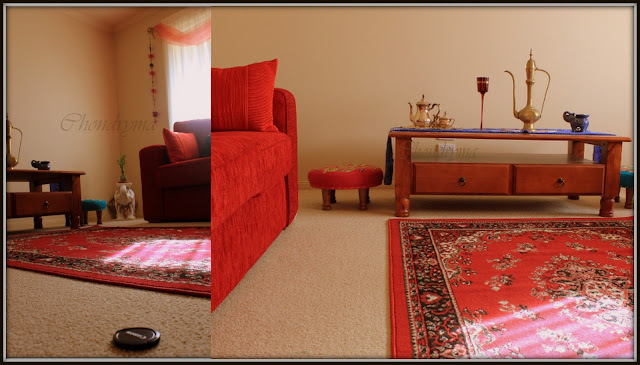 The underlying theme behind each décor in the house was vibrancy and color – so we started filling the lounge room was vibrant colors, red being the primary theme. We used Indian traditional-looking wooden furniture in contrast with the modern-style couch in blood red. Old styled vase, brass antiques, silver pots, jewel-beaded lamps and Turkish kilim rugs were used to reflect vibrancy in the room. An essence of "light of love" is the bond shared between Radha and Krishna – and symbolically to rejoice over the resonance of true love, you can find peacock feather all over our lounge, living and master bed. 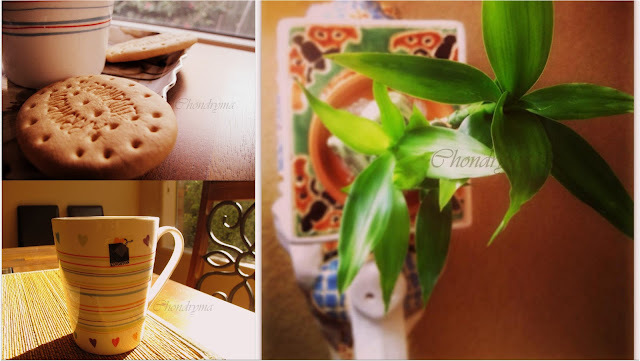 The sun-kissed morning space is shared between the three of us with our cuppa of chai - my husband, I and our lucky bamboo. Another favorite corner of the house is shared with Rabindranath and my gitobitan (collection of Rabindra Sangeet, songs written by Rabindranath Tagore). 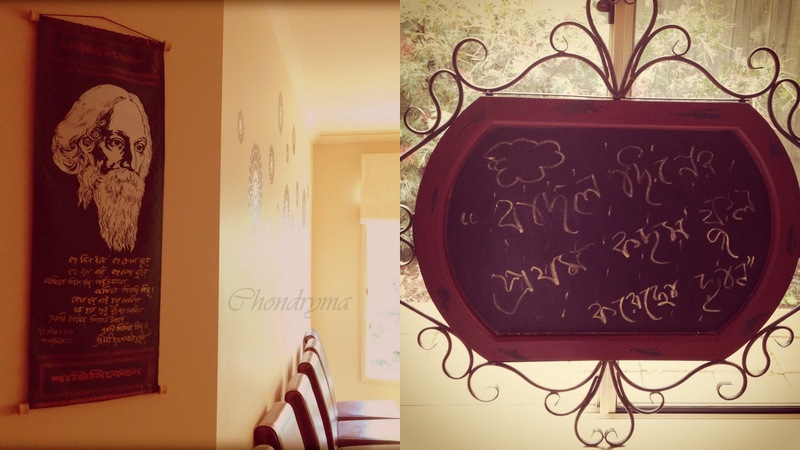 We have recently purchased a french chalk-board, quite an antique one, which we use to write a Rabindra Sangeet each day - songs based on mood, weather or month - after all, Tagore's songs are plenty to choose from! 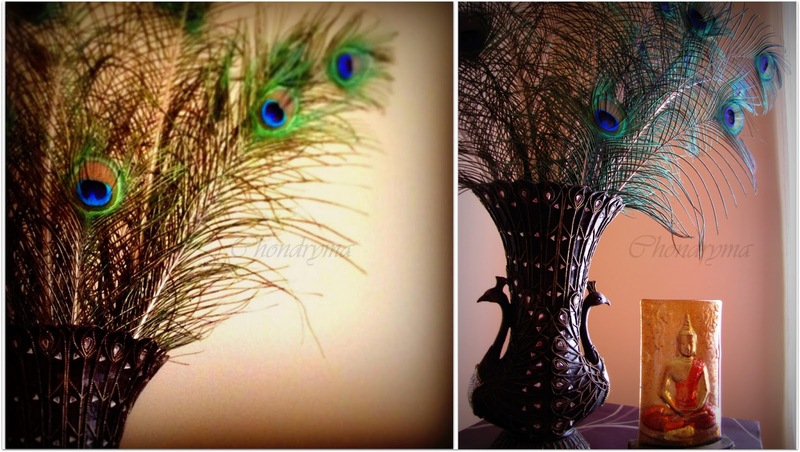 Again an embodiment of love portrayed in peacock-feather colors in our master-bed. 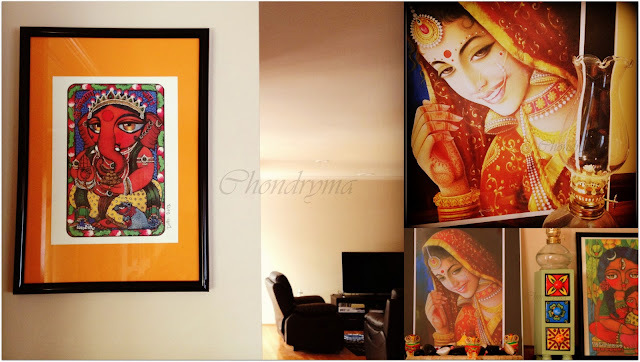 And when it comes to the choice of paintings I would love to have at my house - my preference always takes lead on Dithi's art (http://deezden.blogspot.com.au/) and on Rajasthani paintings. Dithi is a very talented artist whom I have known through her blogs for quite sometime now. And with the news of my dream home, here she sent her wishes along with Ganpati Bappa to look after my house while we stay at work. 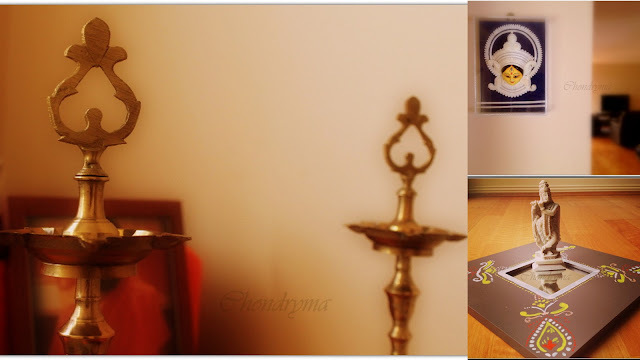 Another unique theme for our decor is BnB - Brass n Bengal, which you can find in almost all corner of our house. To dazzle the space with our light of love, we do prefer an amalgamation of perfumed candles with the traditional oil-lit brass diyas (Indian lamp). And being a bong, you can find Bengal in our kitchen to corridor. 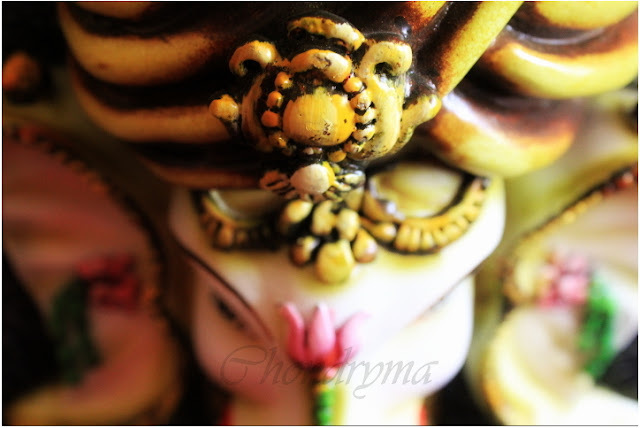 So our home is never complete without seeking blessings from Maa Durga and Sree Krishna. Copyright © Chondryma Chakrobortti 2013. All Rights Reserved. I was wondering what could be the best gift for my mom on this Mothers’s day than singing one of her favorite song and dedicating this to her !! Mom, this was the best way I could say “I love you a lot” !! Bhalobashi Bhalobashi - A tribute to Tagore !! This is a Rabindrasangeet written and composed by “Rabindranath Tagore”. Rabindrasangeet is always sung with less instrumentation and only the vocal plays the magic. So here goes my humble attempt on this lovely composition and a tribute to Rabindranath Tagore on his 152nd birthday. Ei shure kachhe dure jole sthole bajaye baashi!! Digonte kaar kaalo aakhi aakhir jole jaye bhaashi!! I love this song of Asha Bhosle sung in Bengali and always wanted to cover this. The panchamahabhutas (5 basic elements) that form the universe are air, water, fire, earth and the sky above, but to me the 5 basic elements that form part of me are music, art, décor, food and photography. This is Chondryma and welcome to my space of creative blogging. Kichu Jaana Kichu Ajaana (meaning some known unknown) is about my journey with the quest to deep dive into Indian culture and tradition, preserve the ancestral foundations and beliefs of Bengal and get a step closer to India being away from Her for quite a few years now. A WHOLE NEW LOOK AND WEBSITE! Please do not copy or publish the content and photos without permission. 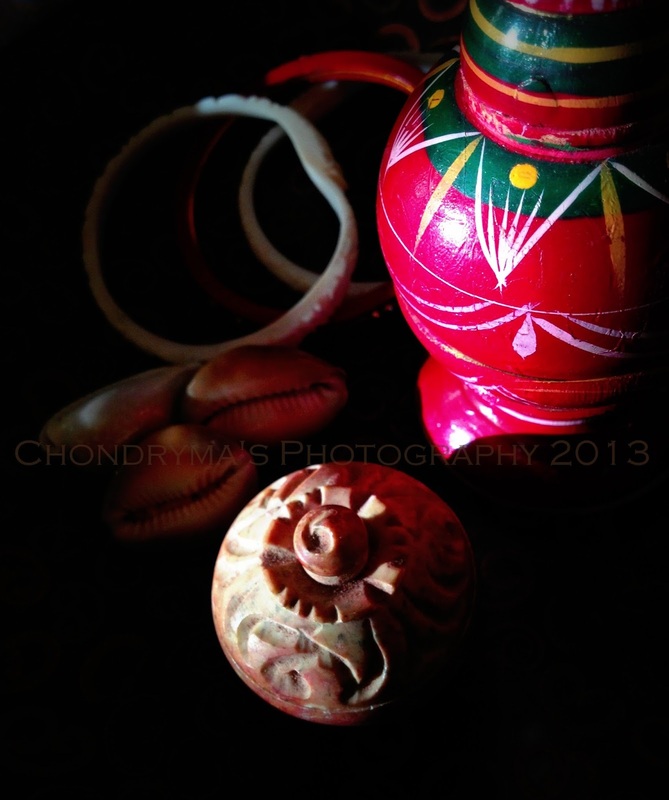 Copyright ©Chondryma2013. Simple theme. Theme images by tolgakolcak. Powered by Blogger.